Home Starring of the Day LOOK: Zayn Malik Spotted Bagging Groceries? LOOK: Zayn Malik Spotted Bagging Groceries? One Direction fans' were undeniably devastated when one of the members of the boy band group quit last March because he wanted to live a normal life and have some private time out of the spotlight. Since leaving the band,fans are still hopeful that Zayn Malik will return to the world's most successful band and reunite with his ex-bandmates once more. began to trend yesterday without any indication that it is exactly real. 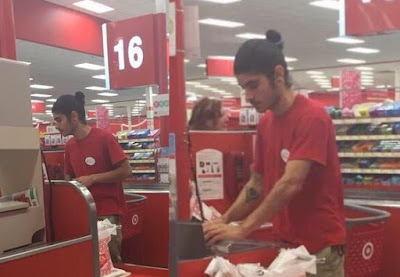 But how true is it that Zayn Malik was spotted bagging groceries at Target after leaving 'One Direction'? Take a closer look at the photos below uploaded by @popcultureshade via twitter. What do you think about these alleged candid shots of Zayn? Is it him or just his look-alike?